Hank and Drover are excited when a quick nap in the back of Slim’s pickup turns into a trip to town. 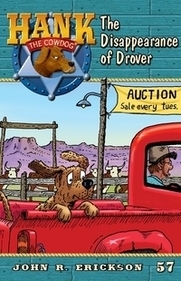 But the excitement turns to drama when they find themselves at the livestock show-and Drover decides to take off to visit his mother. Can Hank track down his faithful sidekick before Slim heads back to the ranch? Or is he off on a wild goose chase?